Snoopreport, innovative Instagram like and comment tracker, lets users monitor Instagram accounts and get useful metrics to research the growth and engagement strategy. The reports provided contain a brief summary of user activity, actions hitmap, liked media tags cloud, user interests. It means that you are able to define the hours and days of user activity and the topics that draw user attention at once. There are a lot of questions and requests on different forums like “How to see every photo someone likes on Instagram” or “How to see someone’s like history on Instagram”. This data isn’t available in Instagram app as Instagram feed can’t be filtered by a certain user’s activity. Snoopreport shares this information in the reports: likes and follows made by the tracked user with the posts photo snippets that link to Instagram. Brief description of the Instagram user actions contains: the number of likes with photos and videos specified, follows, self likes or the posts liked by the monitored user where he/she was tagged, comments likes, favorite user, liked verified users and liked content. It is important for business to monitor competitors as well as their customers and track activity on Instagram in order to get the user insight required for analytics and customization of their marketing strategy. Therefore, we added new features that can really improve the research process of Instagram users and economize your time and efforts when you check Instagram activity. 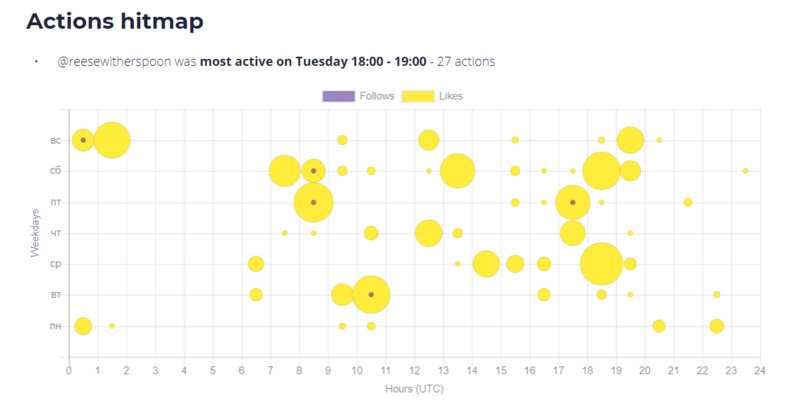 The activity periods will help you to monitor someones Instagram activity and to know the dates and days of the week an user logs in on Instagram and looks through the newsfeed and to evaluate how often he uses Instagram generally. E.g. on the hitmap above it’s evident that Reese Witherspoon was mostly active from 6 p.m. till 7 p.m. on Tuesdays and from 7 a.m. till 9 a.m. on Fridays and Saturdays and she uses Instagram every day. Snoopreport doesn’t analyze all popular hashtags on Instagram. There are many lists with the most used hashtags classified by topics in different blogs. More important data is the hashtags that attract your followers or potential customers. If you start the research of the hashtags that are added to the posts liked by a specific user, you will have to check hundreds of the posts liked to collect the required results and highlight the hashtags interesting to monitored users. You can reveal the interests of your customers, competitor’s followers by using Instagram likes checker and studying the liked media tags cloud. The bigger hashtags are the most frequently they are used in liked posts. Moreover, you can check the tags list to get more accurate data with number of posts containing the most used hashtags so to conclude which of them draw user attention when he likes a post. 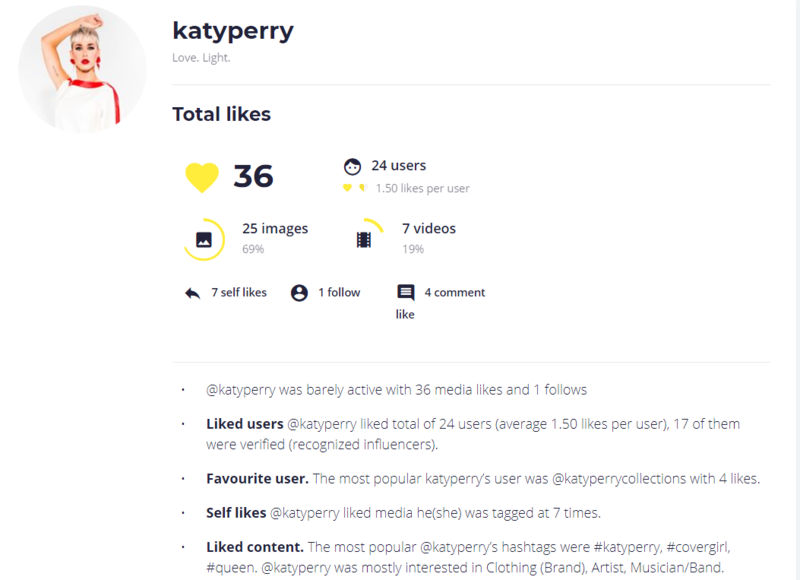 If you want to deepen your knowledge of the user interests, you should view the user interests cloud containing the categories of the Instagram accounts liked by the user. In addition, there is also a list of categories with number of accounts having the categories in their description. All this data is provided in the reports obtained if you track someones Instagram likes. For example, “anitta” account mostly public figure, artist, musician/band categories so obviously the singer likes the similar profiles to attract more followers. make a list of hashtags relevant to your posts so you could attract more new followers. Snoopreport helps marketers and researchers to see what people like on Instagram and analyze user behavior easily and maximize their marketing performance.